With few exceptions, none of the preceding types of fossil preservation provide the opportunity to examine the internal structure of a plant or plant part. In the case of perminerali-zations and petrifactions, however, it is possible to study the internal anatomy of ancient plants (Schopf, 1975). In these fossils, one can examine cells and tissue systems within a plant, as well as produce a series of serial sections that can be used to reconstruct the three-dimensional organization of a structure. This type of fossil is called a permineralization or a petrifaction. 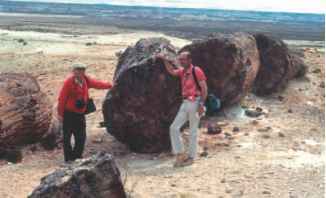 FIGURE 1.40 Several silicified logs in the petrified forest of Patagonia, Argentina. S. Archangelsky, left and T. Delevoryas, right. In both types, the process begins when a plant part becomes immersed in water containing a high concentration of dissolved minerals, the most common being silica (silicon dioxide, SiO2), which is often readily available in areas of volcanic activity. The plant part, for example a log, gets thoroughly waterlogged, with water and dissolved minerals permeating all the cells and tissue systems. The dissolved minerals may be silica compounds (silicification) (FIG. 1.40), carbonates (e.g., calcium carbonate, CaCO3), oxides, pyrites (iron sulfide, FeS2), or some other type of chemical. At this stage it is unclear what happens, but something triggers precipitation of the dissolved mineral (e.g., a change of pH) so that it hardens around and within the plant fragment. 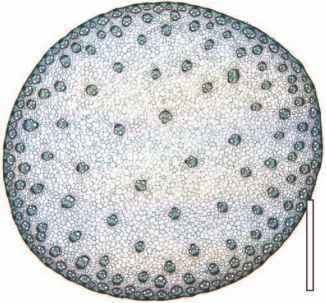 The cell walls of the plant itself may serve as nucleation sites for the growth of the mineral crystals. When the mineral is completely solidified, the plant fragment, in effect, is entombed within solid rock. The fossil can now be sectioned by various means and examined under the microscope to see internal details of the plant. Although several authors have attempted experimental silicification of wood in the laboratory (Leo and Barghoorn, 1976; Laroche et al., 1989), the preservation seen in fossils is often much better. Preservation of plants as petrifactions or permineralizations probably involves several stages of mineral growth, with different sizes of crystals involved. Some more recent work (Channing and Edwards, 2004) suggests that colloidal or gel phases of some minerals may be involved in the apparently rapid preservation of minute details. FIGURE 1.41 Prepared commercial thin section by the James Lomax company of Carboniferous coal ball plants. to transmit light through the section, essentially, the same technique that geologists use to make petrographic rock sections. Rock saws are available that can cut through most types of rock matrix; most have steel blades with diamond particles embedded in the cutting edges. Oil or some other coolant is used to keep the blade from getting too hot as it slices through the rock. Saw blades covered with or made of particles of silicon carbide or some other abrasive can be used to cut through softer material. The fossil to be studied is cut out with a saw, and the surface of the fossil is polished with an appropriate abrasive (e.g., silicon carbide of various grades) until it is smooth. The surface showing the fossil is then attached to a piece of glass with some type of adhesive. After the adhesive has solidified, the glass slide with the piece of permineralized material is placed back in a saw, now a specialized thin-sectioning saw, and the remainder of the rock is cut away to leave as thin a slice as possible. At this point, the rock is still opaque. The next step involves grinding the surface, either by hand on a lapidary wheel or plate, or on a thin-sectioning machine, so that more and more light can pass through the specimen. Eventually, the sliver of rock is thin enough to be examined with a microscope. Sometimes the piece of glass to which the fossil material is attached is the actual slide used for study. In that case, a permanent adhesive, such as epoxy resin, may be used. Some prefer to transfer the ground specimen to a clean microscope slide. In those instances, a cement that can later be remelted is used, such as Lakeside thermoplastic resin. Before the thin section is transferred, it is coated with a transparent plasticlike material to keep the section intact. This thin slice is then placed on a clean slide with a natural or synthetic mounting medium and covered with a cover glass. Once the medium has hardened, the slide can be examined with a compound microscope. Some paleobotanists use no cover glass, but rather examine the rock surface directly using oil immersion microscope objectives; this method has been applied very successfully with the Early Devonian Rhynie chert (see Chapter 8). In a permineralization, minerals fill the cell lumina and the intercellular spaces, but do not completely replace the cell walls. The cell walls still consist of organic matter, although they may be chemically altered to various degrees. Chemically, the various layers of the cell wall may still be distinct (Boyce et al., 2002), and the permineralization may faithfully reproduce the microstructure of the wall, for example the position of cellulose microfibrils (Smoot and Taylor, 1984). Cellular contents have even been described from permineralizations! The processes involved in the formation of certain types of permineralization in silica are being studied in modern hot springs ecosystems like Yellowstone National Park, USA (Channing and Edwards, 2004), and in filamentous microbes from similar ecosystems in New Zealand (Renaut and Jones, 2003; Jones et al., 2004; Phoenix et al., 2005). These studies underscore the complexity of the preservation process. In general it involves the formation of opaline silica (opal-A) films that coat structures and colloidal silica that permeates cells and tissue systems. More recent work has shown that bacteria may be involved in or even necessary for many mineralization processes, and the field of geomicrobiology is a rapidly growing area of study. In biomineralization, the bacteria may serve as catalysts for chemical reactions and also as nucleation sites for mineralization (see Konhauser, 2007 for additional information on this topic). An analogy of the process of permineralization is the technique used to embed and section living biological material. For example, a piece of plant is killed and fixed in an appropriate chemical. It is then passed through a series of alcohols to dehydrate the tissue, and finally transferred to molten paraffin or plastic. When the paraffin is cooled, the plant part is completely embedded in it—paraffin is present within the tissues as well as around them. The entombed specimens can then be serially sectioned to reveal details of the cells and tissue systems. PEEL TECHNIQUE. The peel or acetate peel technique (FIG. 1.42) is a simple and rapid method for preparing sections of permineralized plants (Joy et al., 1956; Galtier and Phillips, 1999). In order to use the peel technique, there must be a certain amount of organic matter still present in the cell walls of the fossil plant. If not, thin sections have to be prepared. The rock containing the fossil is sliced with a rock saw (FIG. 1.43) and the resulting slab is polished (FIG. 1.44), first with a coarse abrasive (100-400 grit size) on a lapidary wheel and finally with abrasive of progressively finer grain sizes (600 grit size). The polished surface is then ready to be etched. If the fossils are entombed in calcium carbonate (see coal balls below), etching is done in a dilute solution (~5%) of hydrochloric acid (FIG. 1.45). The acid reacts with the carbonate, but not with the organic remains, so the mineral material (CaCO3 in this case) is slowly etched away, leaving the plant cell walls (and cellular contents, if present) projecting in relief from the surface of the slab (FIG. 1.46); the etched surface should not be touched at this stage as the cell walls are very delicate. After the surface has been rinsed and air dried, it is ready to be peeled. Acetone, which is an organic solvent, is poured on the etched surface and, before it evaporates, a thin sheet of transparent cellulose acetate (or similar plastic) is carefully rolled on the surface (FIG. 1.47). The acetone will partially dissolve the lower surface of the acetate sheet, converting it to a liquid that flows in and around cell cavities and intercellular spaces. Because acetone is quite volatile, it evaporates readily, so the lower surface of the acetate sheet quickly solidifies, embedding the cell walls within it. 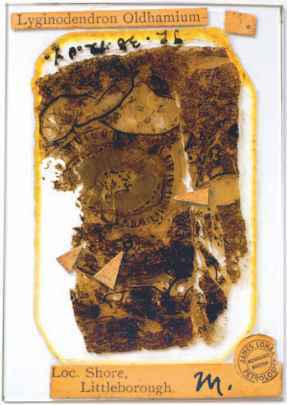 When the acetate is completely dry, it can be pulled from the surface of the rock, taking with it a thin section of the entombed plant (FIG. 1.48) . The greatest advantage of the peel technique is that serial sections can be made quickly down through the rock by polishing, etching, and repeating the process again and again (FIG. 1.49 ). The peel technique (Stewart and Taylor, 1965) can be used for different types of permineralizations, but when the matrix is something other than a calcium or magnesium carbonate, a different acid or a different concentration of acid must be used.